Do you have a pen/pencil collection? Yes. I probably always will. I just collect too many to throw away. This year, I acquired a wooden pen carved to look like a red macaw parrot. It’s adorable. Are any of them chewed? One or two pens, no pencils and definitely not the styluses. Do you prefer handwriting or typing furiously? Depends on the situation. Sometimes I don’t have the option of typing furiously, which I do prefer, because I can say so much more in shorter time spans. How often do you get inspiration? In bursts, these days. Sometimes I don’t have anything for days or weeks, then it’s like—whoops, we forgot to be inspired, so let’s just open the floodgates and wobbly…there’s more than I know what to do with. Are you blogging from a desktop, laptop, tablet or something else? Does inspiration strike in the early morning or late night? If it’s smart, then it’s late at night, because in the morning I am nowhere near coherent these days. I’m more likely to go back to sleep, dream the idea, consider it brilliant and thus “dreamed to life” and requiring no additional action aka—writing it out. Do certain books/music/movies inspire you? How do you incorporate God into your stories? Lately, I’ve been doing it as allegorically as possible. For instance, in my Twilight Trials series, He’s referred to as “The One”. How evil are your villains? Very evil. Terrible, horrible villains. People who made the wrong choices and have no regrets about doing so, with no intention of changing their ways even as it costs them more than they will ever be able to pay. Do you kill off your villains? Why or why not? Are they redeemable? Some of them are, but most of the time, they’d be better off dead. I wouldn’t redeem the current one I’m working on, because he doesn’t want to be redeemed. He’s happy as he is in his own twisted way and changing that would change the whole story. Are the majority of your characters magical beings, humans or halflings? I wish I could say human…no, not really. I like my halflings. Probably always will. What genre are you most comfortable in? Need you even ask? Fantasy! I still dabble in my inspirational pieces and I’ve picked up poetry again, recently. Do you work better solo or in a collaboration? Solo! I’m becoming more partial to it, because trying to explain my brain has led to more frustration than anything else. Do your stories make sense or do they just ramble all over the place? They make sense these days. I’m trying not to be as abstract as I used to be. Are your characters mostly renegades, peacekeepers or a mishmash of both? Both. They dabble in both sides, but realistically, they are bits and bobs of both. Are you a sucker for good grammar? I love beautiful writing and I will not lie. It’s become more simplified and I’m using my shorthand quite a bit now. Carpal Tunnel? No. Thankfully, no. But my wrists do ache when I’ve typed quite a bit. This year’s NaNo reminded me to slow down, for goodness’ sake. Are you long-winded or succinct? Becoming more succinct by day. Do you have typical writer traits such as ink stains on your fingers, a writing instrument always in reach or a piece of notepaper for quick jots? Smudges, yes. A pen stuck through my ponytail or bun, yes. Notebook within five feet. Yes. If not, my phone is always a good substitute. Do you write poetry, stories, novels or a mixture? Still writing a mixture of everything and I want to keep it that way. Do real people or places inspire your writing? Real people and the “what if” question, then my imagination takes over from there and it doesn’t even resemble what I started out with. This year, new experiences have played a large portion in my new inspirational threads for this year. What is your favorite character this year? Milana! She is the unofficial FMC in my novel, Trial by Earth and she honestly caught me by surprise. As much as I loved writing Ellis, I didn’t expect to find myself so attached to her character as well. I had fun writing her interactions with Ellis. What was the most difficult character this year? Ellis!! And of course Greya and Hugo from my Nanowrimo novel this year. Do you talk to your characters? Do they talk back? Lately, they’ve been quiet. Very, very quiet. It worries me, because it means they’re planning something. Something, for instance, like a hundred stories to stuff through my muse by the new year. Are you more comfortable with male or female characters? I’m about equally comfortable with them now. After writing Ellis this year, I’m more inclined to lean towards the guys, but I’m getting back into both sides with my nano novel. Do you follow basic (sometimes overused or cliche plots) with your own twists in or do you just write something different altogether? I’ve been using old themes and putting my own twists on them, so yes, something different. Do you feel called to be a writer? What are you most proud of writing this year? 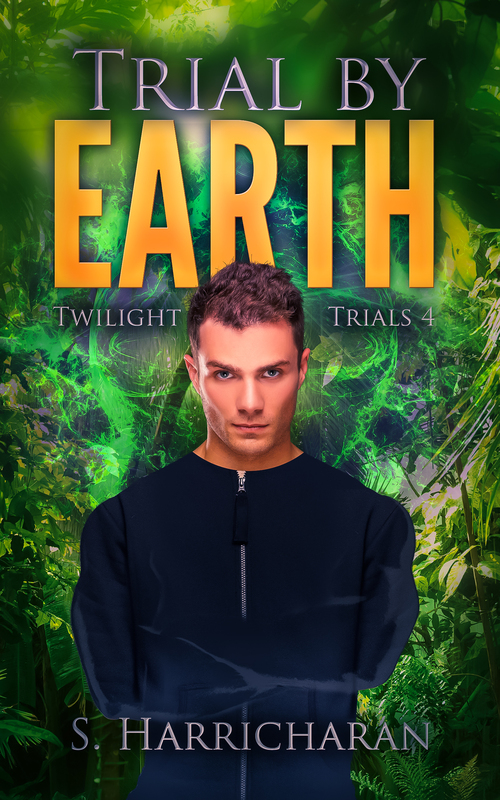 Trial by Earth, because it was three years in the making and I almost didn’t know if I would ever finish it. Just being able to write the end was a breakthrough for me. I was also able to write “The End” on my NaNo14 novel and that was another moment, because I hadn’t been able to do that for a few years as well. Did you finish everything you wanted? I finished my NaNo novel! That was something I didn’t expect, as I’m usually always writing well into the new year. I haven’t finished my Christmas stories and I’m not very happy about that. I’m trying to finish everything I can in the next week or so, but I’m not going to rush it if something doesn’t pan out. Will you be writing in the upcoming year? Absolutely! I won’t be stopping any time soon. What do you plan to write? I have Trial by Metal coming up next, Terrance’s story. I also have my Cupid Cafe novella that I’ve been hoping to release, along with Crooked. Both of them are being rewritten and edited, according to earlier rewrites. I hope to publish them in the upcoming year. Have you set any writing goals? To finish two novels and to write at least four short stories. I’m working with flexible goals this coming year, instead of rigid numbers, so I can maximize my creative energy and output. I think that’s it for this year. It was fantastic! Happy reading and best wishes for you all in the new year.